n•a•p Massaging Bed Rest – Just Go Sit In A Damn Chair | OhGizmo! I’m not going to discount the joys of doing things in bed. Reading, writing and watching TV are all made more enjoyable when you’re sprawled out on a mattress. But for some activities you just have to draw the line and find the strength to get up. No matter what Brookstone is trying to tell/sell you. I mean look at this thing! 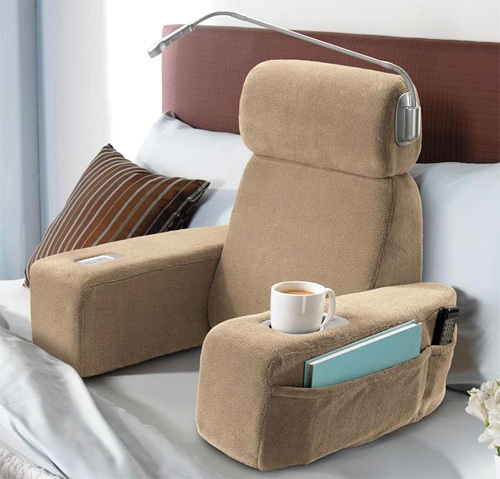 The n•a•p is one of those cushions designed to help you sit up in bed, but all pimped out. In fact it looks like they presented a third grader with crayons and paper and asked them to design the ultimate back rest. There’s a cup holder, pockets and compartments for books and TV remotes, an overhead adjustable LED lamp and even built-in massage functions. That’s right, this bad boy has to be plugged in. The only thing it’s missing is a chilled compartment for your prescription bed sore cream, and maybe a feeding tube because if you’re at the point of using one of these, odds are you can’t be bothered making your way to the kitchen for solid food. Brookstone also wants $99.95 for it, plus what looks like the majority of your bed’s real estate… If life was a board game, humanity would be moving two squares back now. Sounds like jealousy to me. Can’t afford it, huh? On another note, the entire reason for someone to procure such a product might escape a one-tracked mind such as yours. I support my mother, brother and sister in these hard economic times, not to mention my husband and two children. Add on the fact that I am a college student and need a quiet place to study, well then you get me searching online for a product just like this one. When I wish to relax, believe I don’t do it in the middle of mayhem that happens to be my home. So, please open up your mind to the possibility of others having lives, families or homes which differ from your own.